Nancy Davis of the Ivy Group began her investigation of why men don’t use libraries and strategies to increase use with a caveat that she would be making gender generalizations and that some of the points raised were based on an overall view of what the research indicates, the majority of library users are women. Davis stressed that increasing male usage is an opportunity to boost card registration and circulation, increase program attendance and financial support and to connect with more community organizations. She raised an interesting point in regard to increasing financial support by stating that promoting library services, programs and collections to men would result in more men willing to vote in favor of libraries and to think of their local library as a recipient of financial donations when thinking about their family finances or estate planning. Davis recommends giving your library the Male Appeal Test. Is your marketing material full of pictures of moms and kids? Do you have pictures of men using the library on your web site? Is your non-fiction collection outdated? What about staffing in this predominantly female profession? Do your library displays feature quilting and basketry and nothing on fishing, car repair and features on business publications? Additional suggestions include revamping programs to appeal to males such as history, world affairs and politics; scheduling storytimes for dads on nights and weekends, gaming (she cautions against writing gaming off as a teen-only activity), books clubs for men and mentoring programs. Davis’ suggestions for a plan of attack include targeting fathers, she compared men’s use of library with their approach to shopping–men don’t browse–if they aren’t going to ask for directions, we need to make sure signage is informative. Eliminate the emphasis on reading and market the full menu of library services including online resources and non-print resources and position the library as a source of information and solutions to problems, particularly in this economic climate we are in a powerful position to do so. She emphasized marketing e-resources and remote access. We now have the first generation of kids who have grown up with the internet and several generations of men who are computer savvy who would be willing to use library resources if it didn’t mean going to the library. 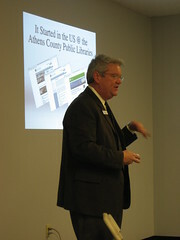 The presentation was followed by a discussion of what libraries are doing to lure males to their library. Some suggestions included circulating tools, posting library info at the town dump and hardware store, programs on the history of brewing, giong green and an entrepreneurial career series. One male librarian noted that libraries are stacked against men and that having males on the staff helps to bring men in. How can we foster media literacy when there is more information available in more formats than at any time in history? How do we encourage responsible civic participation in the increasingly narrow space between uninformed opinion and self-serving corporate propaganda? In this session, four panelists addressed the blurry nexus between news production and news consumption in an age of scaled-back print media and ramped-up internet chatter. 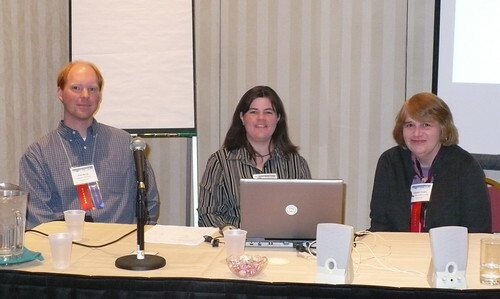 Bill Densmore and Meredith McCulloch from the New England News Forum facilitated a lively discussion on cooperative ventures among public libraries and local newspapers. Editor Martin Reynolds weighed in virtually with a description of just such a venture in California, where the Oakland Tribune has opened a news desk in the West Oakland branch library in an effort to give the residents access to the media and dispel perceptions that the paper is out of touch with the lives of real people in the community it serves. 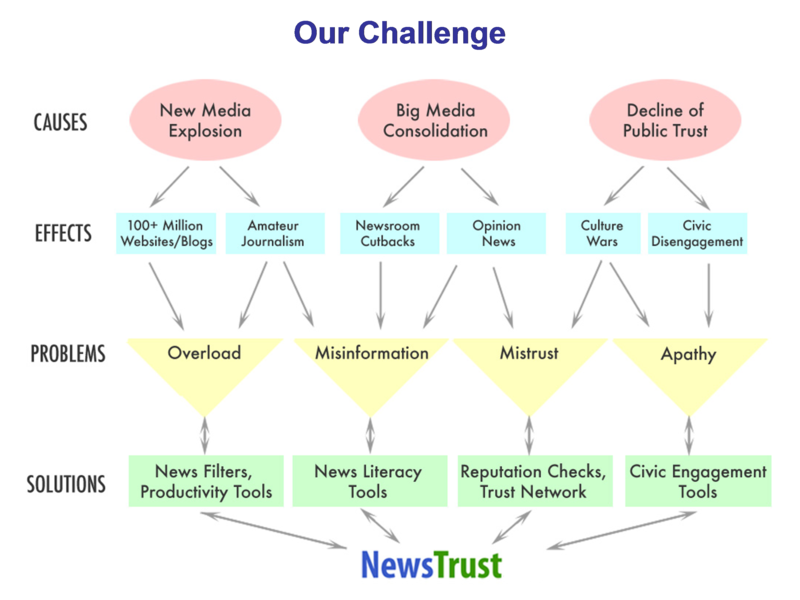 And Mike LaBonte gave a fascinating presentation on Newstrust, a new online effort to connect citizens and journalists to encourage informed analysis of online journalism. Check them out! Amy started by discussing some of the issues in collection development. We often face situations where parents are concerned about what their children are reading. Part of our job is to educate people about the books in our collection and why they’re there. This is a huge continuum – so what do we do? We all do have different ideas about what’s appropriate. How does this affect our library collections? Who are we serving? What do teen readers like to read? They are difficult to stereotype. They read across all genres. Our collections need to reflect this. Young people read for a variety of reasons: to satisfy curiosity; taking part in a taboo text builds a shared experience among peers; they enjoy what they read – it makes them feel good. Teen readers are developing a relationship with reading. 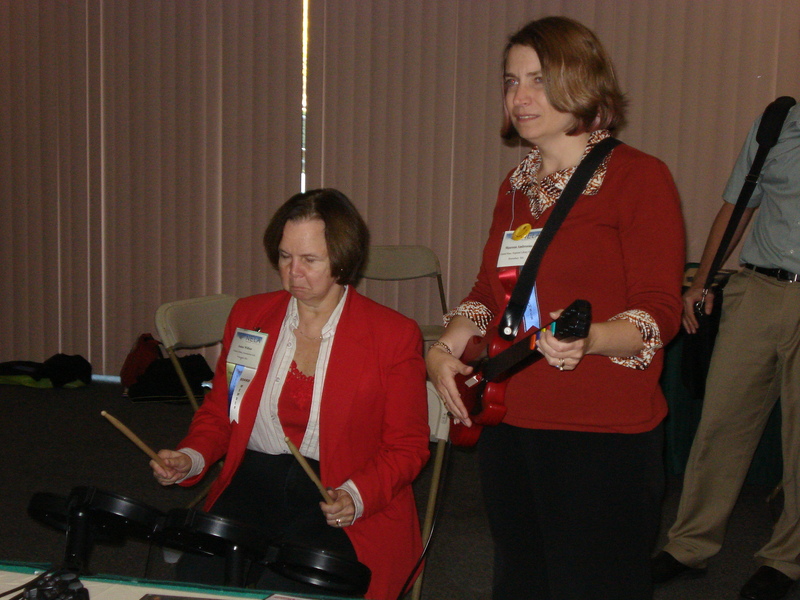 The Young Adult librarian nourishes that relationship, and must provide a wide variety of materials. As adults we want freedom to read, and feel empowered to request what we want. Young people often find barriers in getting the information and reading materials they want. We need to authorize all sorts of reading experiences in how we select material. We also need to reassure them that it’s okay to not finish a book. Collections must present a variety of choices for young people. How do we ensure a good collection to reflect what young people want? The difference between being a selector and censor is narrow. One is positive, the other is negative. The selector looks for values, strengths, and reasons to keep the book. Example: Gossip Girl – very popular and controversial. Why is it popular? Because it’s part of the shared experience – “everyone” is reading it and/or watching the TV show. The selector asks: why do we keep this book? Just as not all adult books are of the highest literary value, we need to have books that are popular to teens that aren’t necessarily of strong literary merit. We also need to make sure that we read the books they want so that we aren’t just dismissing them outright. Urban Fiction/ Street Lit: enjoying a resurgence in popularity. Self-published, sold on the street about life on the street. Includes sexual content, and drug and alcohol abuse. Some feel this is dangerous to young people. But it’s popular fiction. Triple Crown publishing is a publisher of urban fiction for adults and teens. These are often very powerful critiques of society that offer a different and much needed perspective. How do we know what books are appropriate for what readers? We can’t know. Labeling books does not work. If we want to encourage reading and library use we can’t limit it for them. Often annotated booklists (passive programming)are a way to connect books to readers. YA designation is broad – ages 12 – 18. Aspirational age is important to consider (12 year olds want to read about 14 year olds, 16 year olds want to read about 18 year olds and so on). “The right book for the right child at the right time.” This implies that there’s only one “right” book, and that we’re the ones to decide what the right book is. We need to be reading ourselves and talking to young people about what they like to read. In summary, we need to be aware of what books are popular with teen readers, understand why they want to read them, and make sure that the books they want are accessible to them. Meet Koha, the first open source Integrated Library System. Marc Roberson of LibLime demonstrates Koha’s extensive feature set and outlines the advantages of the open-source development model. LibLime was founded by Josh Ferraro, and he worked at the first library in the nation to use open source. That software is now known as Koha. But the biggest problem with open source is: who will support it? Open source is supported by the use community, and everyone gives back for what they get (that’s what “koha” means). Because of this, the users are the developers, so needed features are ready in days to weeks instead of years to never with traditional vendors. Free? that’s just not good enough anymore – it’s often not tailored. The library’s goal should be to minimize the cost of delivering a useful product to patrons. So even Koha/LibLime does cost money, the value of what is delivered is a fraction of what traditional ILSs deliver. For more information on LibLime, visit the LibLime website. Search results – function display, and can be customized; results are available as rss feed, can be limited to just currently available items; faceted search is available on the left, to show all the extras catalogers have been adding to records for years – subjects, series, etc. It’s all web-based, so no more software being installed. And it works well with all browsers. It can be hosted either at the library or at LibLime (usually about 20% cheaper to host with LibLime because they have such large server capacity and don’t have to go through library hardware and staff to maintain the system). Has a “news” feed, to let staff know of staff meetings, announcement, etc. Has templates to print spine labels and more. Easy to search within System Preferences to find out where settings need to be made. Can control default actions – for instance, for overdue notices, the first is a mild reminder, the second is a bill, etc.